Whether you’re looking for the perfect gift for your newlywed friends, anniversary gift, or you want to upgrade your own dining set, the best steak knife set is a great idea for anyone’s home! We found 10 great sets of steak knives, from formal to casual, that you’ll love breaking out at your next dinner party, family barbecue, or Sunday roast! Before buying new steak knives for you or your loved ones, here are a few features to consider first. Pieces: When we list the number of pieces, we’re talking about the number of knives in each set. This will help you find the right number of knives to suit your family, or to stock up for your next dinner party! Handle Material: Some of the knives we reviewed are forged as one piece, with the blade and handle made of the same material. Others have handles added to them in wood, plastic, or other materials for a classic look or better grip. Edge Type: Steak knives come with two types of edges: serrated and straight. Straight edge knives are extremely sharp and slice through meat like a chef’s knife. Serrated edge knives use sharp ridges to saw through your meat like, well, a saw! 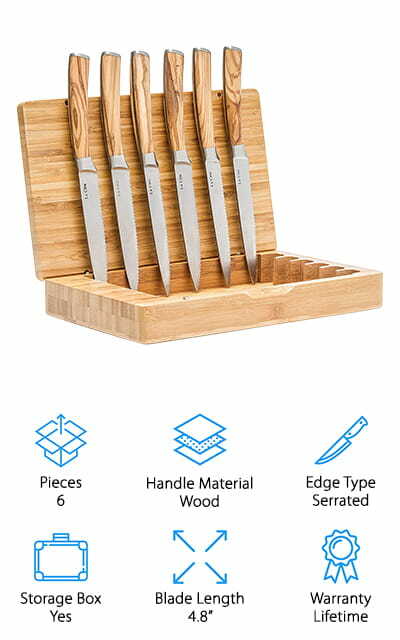 Storage Box: We’ll let you know if each knife set comes with a storage box you can use to keep your knives in great condition between uses. Storage boxes protect knives from extra dings and chips, and they make great gifts too! Blade Length: We found a variety of blade lengths to suit everyone’s tastes. You can find a set that coordinates well with your current dining cutlery, or grab a new set for your next barbecue to cut through steaks, chops, and more! Warranty: Investing in the best quality steak knives means you’ll have them in your life for a long time. A warranty is a sign the company stands by their product, and they’ll replace or repair your knives if something does happen. Now that you know what to look for, let’s find the best steak knife set for your needs! We found great options if you’re on a budget, luxury sets if you’re ready to upgrade, and everything in between. There are sets that coordinate with whatever silverware you already own, and a few made to stand out! If you’re pressed for time, start by checking out the Top Pick and Budget Pick, and then come back to read about the rest! Our Top Pick for the best high-end steak knives goes to this classic and durable set from Wusthof, a German brand known for making knives and serving utensils. 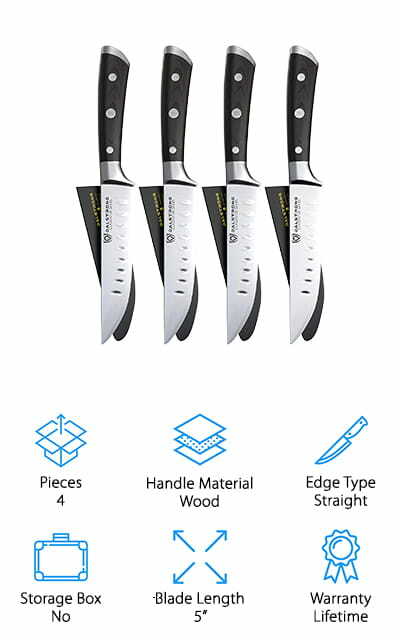 This set of 6 knives is forged from high-carbon stainless steel, making them both sharp and tough for cutting through all kinds of meat with ease. The hand-forged edges are razor thin, allowing you to have complete control while you cut, even through tough meats and vegetables. We like the traditional look of these knives and think they’ll fit in perfectly with your current silverware at your next dinner party. You can even get the handle engraved with initials for a personal touch to your knives – or get them as a gift! Oh, and this knife set is dishwasher safe, so clean up after your next dinner party will be a breeze! 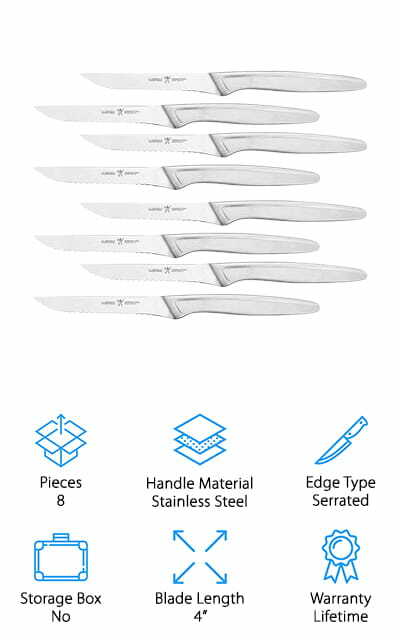 These knives are made to last, and they come with a lifetime guarantee for added confidence in your investment! This set of 4 serrated knives is our Budget Pick for the best steak knives for the money! We like this steak knife set because they are sharp, easy to use, and dishwasher safe for quick cleanup! They are designed specifically for cutting steaks, with a long blade, sharp serrated edges, and a comfortable handle to make slicing your steaks easy and clean. The blade and handle are forged as one piece, making these knives lightweight and easy to handle. Another benefit to having the knives made in one piece is that there are no gaps for rust to form! You can even throw these in the dishwasher without worrying about rust or extra wear. We also like the sleek, classic look of these knives because they’ll look great next to your own silverware at your next dinner party! Since they’re inexpensive, you can stock up for a large dinner party or your next big barbecue without breaking your budget! Another set of budget-friendly steak knives is this set of 4 beautiful knives from Dalstrong. These knives use a full-tang design, meaning the blade and handle are forged as one piece, which keeps them sturdy and prevents the blade from wobbling out of the handle. We like that the blades are made of high-carbon steel that has been heat-treated and sharpened by hand for precision and sharpness. The wood handle gives these a classic look and also gives you better grip and control while cutting steaks, chops, and other thick meats! We also like that the blades have small dimples on both sides that prevent meat from sticking to the blade! 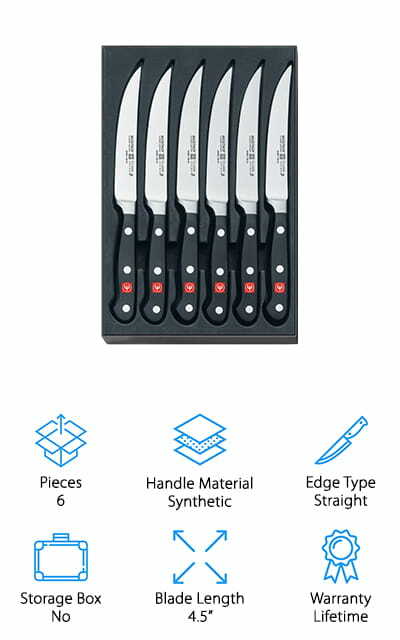 Each knife comes with its own plastic guard you can use to store them, which prevents them from getting chipped or scratched in a drawer or box. We think this straight-edged steak knife set would make a great gift – and get a set for you, too! When looking for the best ceramic steak knives, we came across this set of nonstick knives that are perfect for cutting steak, poultry, and whatever meats you’re craving! 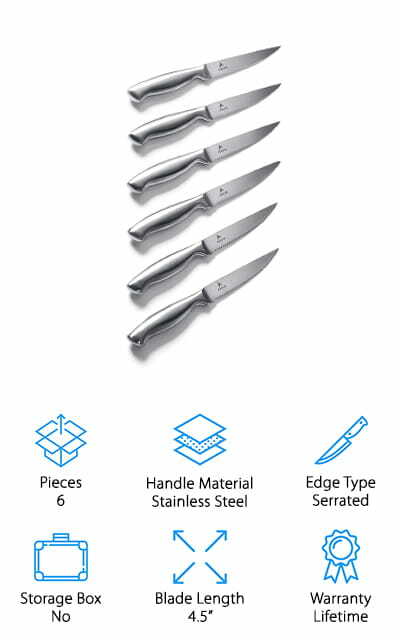 This set of 6 serrated knives is made of tough stainless steel and coated with ceramic to make them durable and non stick for easy cutting. We think that these are great for using with sticky foods like cheese and heavy starches without gumming up the blades! The serrated blades are sharp and cut through even tough meats with ease. We also like the ergonomic design of the handle, which gives you better grip and control while slicing up your favorite pork chops or Sunday roast. To clean them, you can hand wash them or drop them in the dishwasher at the end of a nice dinner with family and friends! The all-black design is modern and sleek, and they come in white or red versions too if you want to mix things up. For your next large family get-together, grab a set of these gorgeous serrated steak knives from J.A. Henckels to serve with steaks, roasts, and chops! We like that this set comes with 8 knives, which is plenty for your family and loved ones to enjoy a nice meal together. 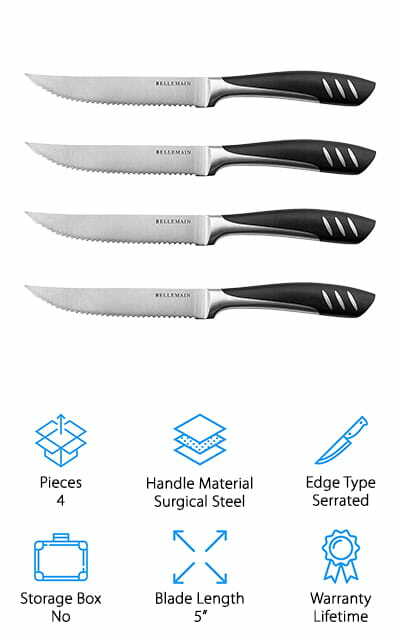 Each knife is made from a single piece of rust and corrosion-resistant stainless steel, making them strong and durable. The classic, all steel design will blend in seamlessly with your casual and formal silverware for a cohesive dinner table setting. They’re also inexpensive enough to stock up the next time you have a large family gathering or barbecue! We also like that they come with a lifetime warranty, so you can feel confident that these knives are built to last – and the company will stand by their product for years to come. These are the best serrated steak knives for large parties and families to use for their favorite family meals! In our hunt for the best rated steak knives, we found this professional-grade set that foodies and home chefs will enjoy using with their favorite meats! This set of 6 steak knives from Mercer is made of serrated stainless steel that’s sharp and tough enough to handle thick cuts of meat with ease. They’re also resistant to rust, corrosion, and discoloration due to heat or chemicals. We like the Santoprene handles, which provide tons of extra grip and control while cutting, even if your hands are wet! The handles even work well if they come in contact with kitchen oils, heat, or extreme cold. To keep your knives stored properly, this set also comes with a fabric storage roll that you can store in a drawer or box. The cover protects your knives from dings or scratches – and you from injury! These knives are a favorite among professions cooks and chefs, and we think you’ll agree they’re a great investment! 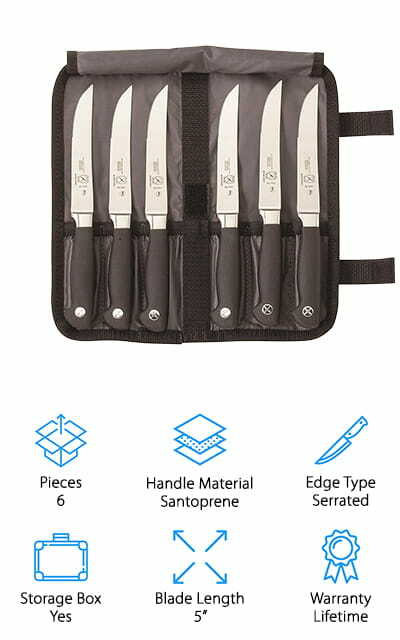 If you are looking for a great steak knife set that the whole family will enjoy using, consider grabbing this serrated set of 6 knives from Ashlar! These knives are built for everyone to be able to use, including those with small hands. Each knife is made of a solid piece of stainless steel that’s rust and corrosive-resistant, along with being dishwasher safe! No worries about the blades and handles separating over time! The handles are weighted for easy handling, making them great for teaching your youngsters to use serrated knives with meats! We also like that the sharp serrated edge cuts through tough meats and tender vegetables with ease, so you can enjoy your meal without doing a lot of work! The stainless steel finish of the blade and handle will fit in perfectly with your classic, modern, or formal silverware. Since they coordinate so well with other existing silverware, they also make great gifts for family and friends! If you’re wondering who makes the best steak knives to give as a gift, consider picking up this beautiful set of knives from Culina! 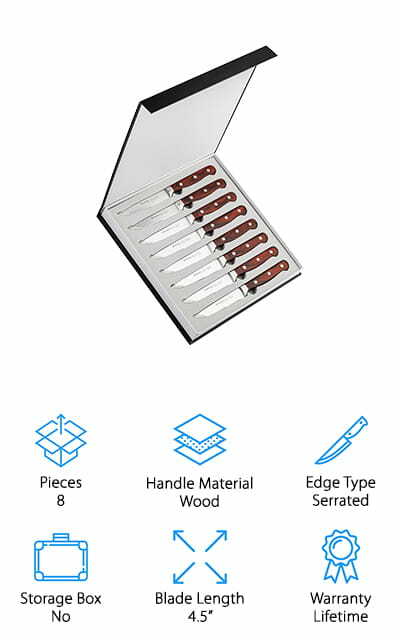 This set of 8 steak knives is made of durable and rust-resistant stainless steel that has been polished for a high-end look. We like that the blade and handle are forged as one piece, which means you won’t ever have to worry about the handles wearing out or blades coming loose. 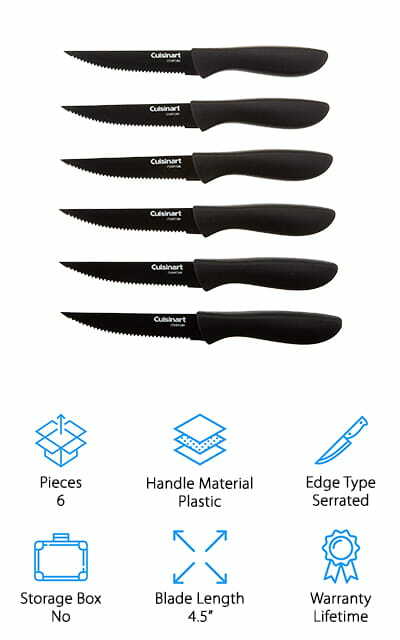 The serrated edges are sharp and cut through tough meats or delicate vegetables with ease. We also like the simple, classic design of these knives because they match well with just about any silverware set! 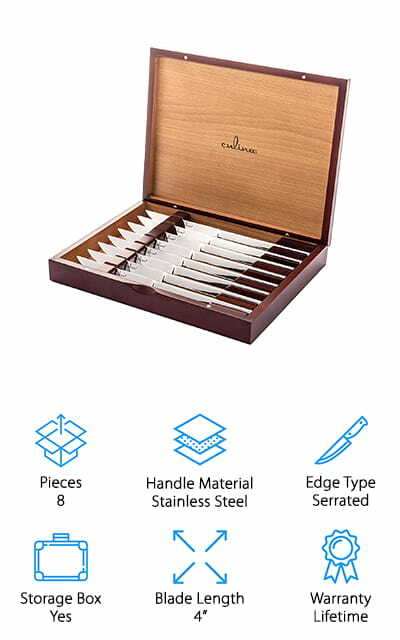 The knives come in a beautiful cherry stained wooden box, which is great for keeping your knives in perfect shape when storing them! We think that this set of steak knives would make a wonderful wedding gift, anniversary present, and because they’re inexpensive, you can grab a set for yourself! Another great option for a set of steak knives that make a great option for gift giving is this set from Emojoy! This set of 8 steak knives comes in a nice package that looks great on its own, or add a festive ribbon or bow for some added fun! It also works well to keep the knives safe for storage. Okay, on to the knives! They are made of German surgical steel, which is resistant to corrosion and rust. The blade and handle are forged as one piece, with a luxurious pakkawood handle over top. We like the classic, yet casual look of these knives – perfect for barbecues, parties, and everyday use! The handle also adds a nice weight to each knife, giving you better control while slicing heavy meats. We also like that these knives can be either hand-washed or tossed in the dishwasher to get them clean and ready for your next dinner party or family barbecue! Last up in our best steak knives review is this gorgeous set of wood-handled steak knives from La Cote that would make a great gift for friends and family who are environmentally conscious or just enjoy a little luxury in their lives! These knives are made with Japanese steel, which is lightweight, durable, and almost impossible to rust. We also like that the handles are made with olive wood, which is incredibly dense and won’t soak up oils or stains while you’re cooking or eating. Olive wood is also bacteria-resistant, sustainable, environmentally friendly, and ethically sourced, making these a great option for people who are mindful of what they bring into their home. The handles are all handmade, and work well for both left and right-handed users! They come in a beautiful box made of bamboo that coordinates well with the olive wood. These are another great option for newlyweds, family, and friends who enjoy the finer things in life!